FiberTite® roofing membrane withstands snow, sub-zero temperatures, hot summers — and hailstones two-inches in diameter on manufacturing facility roof. 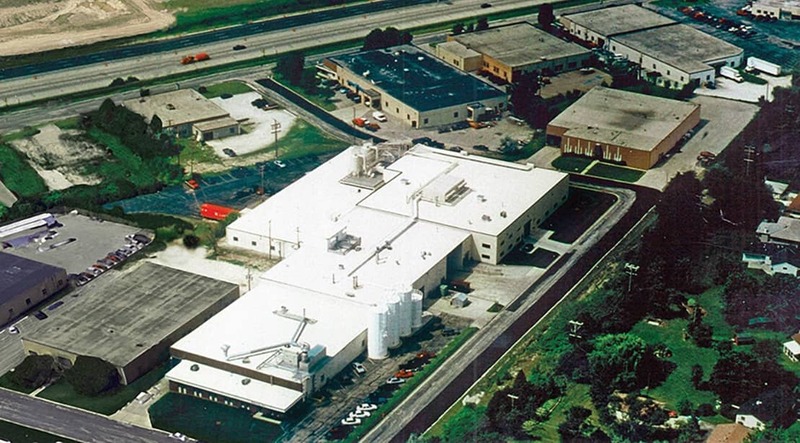 Location: Menomonee Falls, WI U.S.A.
Nestled in the heart of the Midwest in Menomonee Falls, Wisconsin, Glenroy, Inc. manufactures extrusion coated, laminated and printed products for the flexible packaging industry. Promising lead times that beat all packaging industry standards, Glenroy’s good name rides on their ability to meet customers’ tight deadlines. Established in 1965, Glenroy knows well that building a reputation for reliability takes time. In 1984, Glenroy gave FiberTite, a roofing system that had been on the market for only five years, a chance to build its own good name. Glenroy bought a FiberTite Roofing System to recover a section of their manufacturing facility. Pleased with its performance, Glenroy reroofed a second facility with FiberTite in 1987 and then bought a third system in 1998 to protect an expansion of their plant for a total of 61,000 square feet of FiberTite. Time, however, has not been the only test of FiberTite’s stamina. In the summer of 2006, a severe hailstorm pummeled Glenroy’s manufacturing facilities with hailstones two inches in diameter and greater. The hail shattered a 15-year-old convention reinforced PVC system on one of their facilities. Yet, the oldest FiberTite roof, installed twenty-two years earlier, survived. A 22-year performance record in conditions like this can make anyone wonder how long this roofing system will last. In August of 2006, after the hailstorm, Seaman Corporation, manufacturer of FiberTite Roofing Systems, sampled the most weathered looking section of membrane on the Glenroy facilities, which came from the 1987 roof. They ran a battery of tests on the sample in their own in-house laboratory and the results were compared with performance characteristics of a newly manufactured FiberTite membrane with the same specifications. Findings of the tests revealed minimal variation in thickness, breaking strength, and hydrostatic resistance between the two membranes. Since FiberTite’s introduction in 1979, over 99% of FiberTite roofs ever installed across the U.S. are still protecting.